After finally curing myself of my compulsion to argue with reality (pausing while ya’ll laugh your asses off at that…) I have discovered I’ve just transferred this habit to arguing with people about whether or not THEY are arguing with reality. …yes, I know what that sounds like when I say it out loud, but at least I know I’m doing it. Ever since I came back from my retreat my groovy peaceful has been tested as I get caught up in these debates with people being irrational. Inside my head I am shouting OH MY GOD I AM NOT A TREE I AM NOT A TREE, and while this gets me some points for self awareness, it’s really not going well in the outside world. But I had a great insight during meditation; a paradigm shift that has cured me of arguing with others about their arguing with reality (pausing for more laughter…) In those moments when it is very clear someone’s monkey mind is driving the bus and they are all riddled with that ego illusion talk, instead of trying to point that out to them, I can see something akin to the opening of The Simpsons with Maggie at her toy wheel. 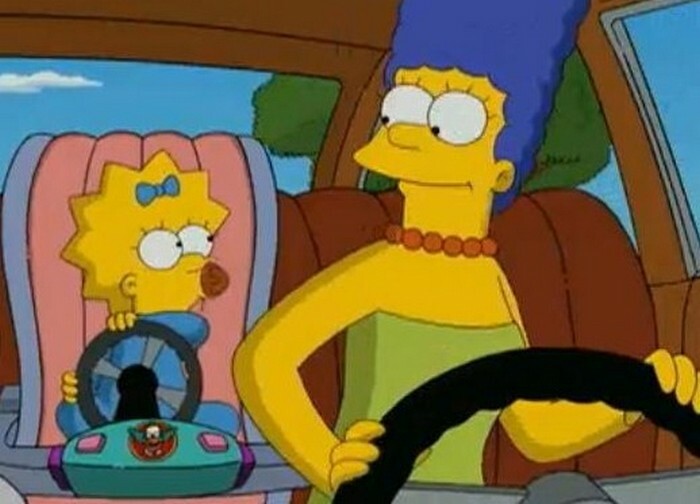 In that context it’s cute: aw… lookit her thinking she’s driving. No harm done, and the illusion makes the wee lass think she’s in control. So for me this means their monkey delusion driving is no longer annoying or threatening. I no longer have to intervene to protect anyone from incompetent driving, I can just sit back and watch them try. Kinda jolly really, suddenly these interactions are fun instead of: wrong just wrong let me tell you why you’re wrong (twitch). The whole interaction changes for me, it takes the conflict out of it and I can get back to enjoying humanity and the antics we all go through as we grapple with our monkeys. It is haunting how close this fits with what I’ve been doing. It’s embarrassing to realize how often I’ve been the old woman in this clip. I need to stop doing that. …or at least catch myself before I crash the car. Pardon me while milk snorts out my nose! You are too funny, Valerie. Maybe you’re a tree with a monkey swinging from your branches. : Burt Reynolds is my Spirit Guide. I think the truth we are all seeking, in our own way, is what kind of moustashe our spirit guide has. My monkey mind reeeeealy wanted to snort at the clip* but I managed to hold it off. *it was even funnier when I just thought about how the monkey** couldn’t see over the steering wheel so how could it drive? **I know it’s probably an orangutang and not a monkey but orangutang is too hard to spell. Twice. PS – this is what happens when you take Valerie’s advice about Robaxicet. Making the world a better place, one pharmaceutical recommendation at a time.